Location, location, location. Friendly staff. Old world charm. Reception.Room inspite the air conditioning not working right. Classic old grand hotel, with beautiful details and architectural gems. Very old facilities, was not hygienic, had a bad smell! Had to change hotels as was traveling with parents and young child. The staff did however move us to another room in the second night but was still bad! The only good thing about this hotel is the location! Good location. Helpful front desk staff. Pleasant hallways. Comfortable bed. Lobby bar service is uneven but we enjoyed having a drink there each night. Hotel was terrible, it was falling apart, wall paper,carpets, elevator,staff, worst hotel that i have been to, do not go there, shower? nope just a big stream of water, phone? did not work, you want wifi? good luck, this hotel should not be on your page. Beautiful building with elegant reception and breakfast areas. The breakfast was the best we had on our vacation. The location was great for what we wanted to do in Palermo. There were many fine restaurants within walking distance as well as many significant historical and cultural attractions. The concierges were very professional and helpful. Grand Hotel Et Des Palmes This rating is a reflection of how the property compares to the industry standard when it comes to price, facilities and services available. It's based on a self-evaluation by the property. Use this rating to help choose your stay! Grand Hotel Et Des Palmes is an elegant Art Nouveau building, right outside the restricted traffic area. 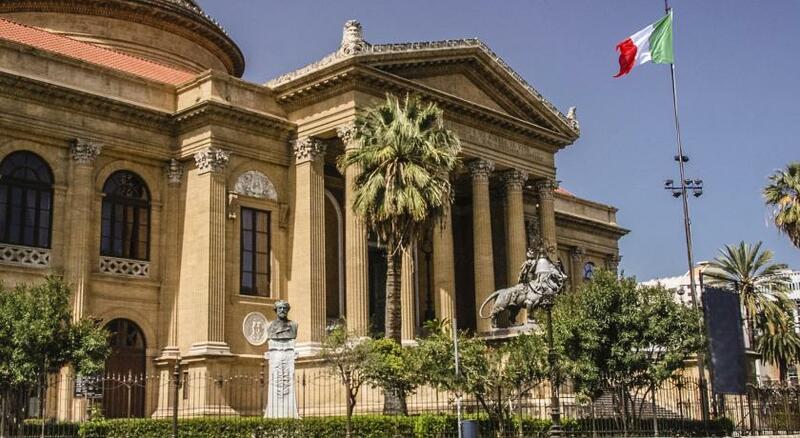 It is a 5-minute walk from Palermo’s Massimo and Politeama Theaters. The property has classically furnished rooms and an extensive continental breakfast. Rooms at Des Palmes are decorated with traditional furniture and fine fabrics. Each has air conditioning, satellite TV and a mini-bar. Breakfast is served in a luxurious hall, and includes Sicilian specialties such as almond pastries and granita crushed ice in summer. Il Gattopardo piano bar serves cocktails and Marsala dessert wine. The on-site restaurant is open for dinner and offers a blend of Mediterranean and European cuisine. 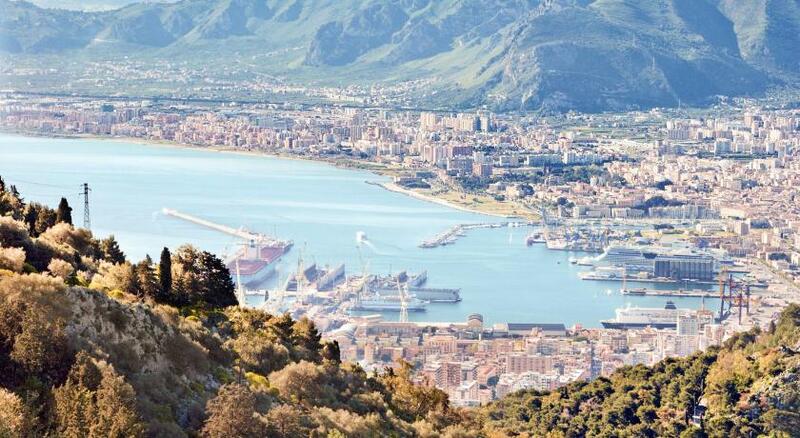 Palermo Port, where ferries depart for Cagliari and Naples, is a 10-minute walk away. Palermo Cathedral is 1 mi from the hotel. 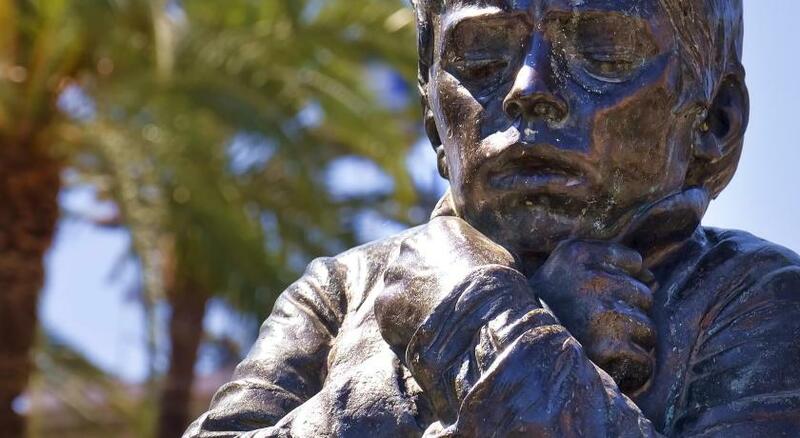 When would you like to stay at Grand Hotel Et Des Palmes? Hotel surroundings – This neighborhood is a great choice for travelers interested in monuments, food and culture – Check location Great location - show map Guests loved walking around the neighborhood! House Rules Grand Hotel Et Des Palmes takes special requests – add in the next step! All children from 4 to 12 year are charged EUR 20 per night for extra beds. Grand Hotel Et Des Palmes accepts these cards and reserves the right to temporarily hold an amount prior to arrival. Please note that the restaurant is open from April until October. WiFi in the room was very poor. Breakfast also not very exciting. Same selection each day. Hotel needs to update selection. Also if you are going to serve scrambled eggs then these should be hot. Hotel was beautiful, clean. Staff helpful. A beautiful hotel, and a very competent and nice personal ! Junior suite carpets and ceiling might need small update, but the atmosphere gets you to 'forget' these kind of small items. We were upgraded to junior suite as there were not many other guests (November). It was an excellent bonus, even though we didn't find much use for the additional room. Breakfast includes everything from bacon and eggs to fresh fruits and sweet cakes. It also included spumante, and that really highlighted our morning. The breakfast room is gorgeous and also other public areas were pleasant. 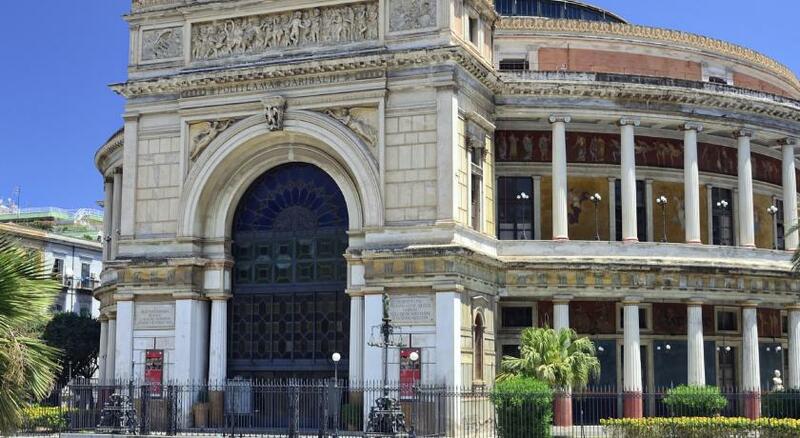 The location of the hotel is excellent, as there is only a short walk to main attractions of Palermo. Remember to visit nearby Mercato Vuccheria in the evening, lots of people and music! We would have liked a pre-dinner drink in the bar, but we found the bar staff quite unreceptive to our requests. I had stayed at this hotel 2 years before and knew what to expect. It IS deliciously old world, not perfect, but perfect within this genre. Ok, first, you need to know something before starting this review. We are talking about an hotel funded in the late 1800. Yes, It’s a classic. Big rooms, high ceilings,a roomy bathroom. But unlike others hotels, this has been adapted trough time, It’s well kept. The staff is nice and kind, breakfast it’s good and served in a classic late 1800’s saloon, was a nice experience. The hotel was very "tired". It must have been beautiful in its day but the carpets in the halls are dirty and there is paint peeling off the walls. The air conditioning did not work. It is just an old hotel in need of a lot of tic. It is a grand old building. The breakfast was good and served in a gorgeous ballroom. Hotel was horribly dated and dirty. The front entrance was not swept the entire 3 days we were there. Finger prints all over the glass, filthy rugs and dirt and grime everywhere. It is one thing to be dated but unacceptable to be dirty! Breakfast was fine, but coffee cold at best. Air-conditioning didn't cool the room effectively. Grand old hotel in good location with comfortable beds and a good bathroom.